Two perennial contenders, the Minnesota Vikings and Dallas Cowboys, faced off on October 6, 1974, but the teams were in very different places as they headed into the fourth week of the NFL season. The Vikings, coached by Bud Grant for the eighth year, were the defending NFC Champions and off to a 3-0 start. Dallas had been to the playoffs in each of the previous eight years under Head Coach Tom Landry, but was 1-2 and had scored only 16 points combined in the previous two games. There were 57,847 fans in attendance at Texas Stadium, and the Cowboys struck first four minutes into the contest with a big play when QB Roger Staubach threw to WR Golden Richards for a 58-yard touchdown. Efren Herrera added the extra point for the early 7-0 lead. Before the opening period was over, the Vikings narrowed the margin to 7-3 with a 48-yard Fred Cox field goal. 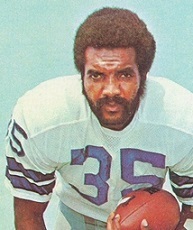 Early in the second quarter, the Cowboys reached the Minnesota 38 but a Staubach pass was intercepted by LB Amos Martin. Three plays later, QB Fran Tarkenton (pictured at top) threw down the middle to FB Chuck Foreman, who was isolated on LB D.D. Lewis, and it was complete for a 66-yard TD. Cox added the point after and the visitors were in front by 10-7. Minnesota continued to thwart the Cowboys, and Staubach, whose slump had contributed to the club’s offensive woes, was the principal victim. He was picked off a second time, by CB Nate Wright at the Dallas 21, but while the Vikings got more points, they were forced to settle for a 30-yard Cox field goal and took a 13-7 lead into halftime. In the third quarter, Wright intercepted Staubach again, on this occasion grabbing the ball away from WR Drew Pearson at the Minnesota 36. The Vikings advanced 64 yards in eight plays, the last a toss to Foreman (pictured at left), who made a leaping grab over Lewis in the end zone for a 13-yard touchdown. Cox’s point after gave Minnesota an extended lead of 20-7. A fourth interception of a Staubach pass, this time by DB Terry Brown at the Dallas 31, had the restless home crowd booing. However, the defense pushed the Vikings back and the tide began to turn in the fourth quarter. The Cowboys put together a 39-yard drive featuring a Staubach completion to HB Calvin Hill for 22 yards and two runs by Hill for six yards apiece. The series culminated in Staubach throwing to FB Walt Garrison for a five yard touchdown and Herrera’s kick narrowed the score to 20-14. With 8:26 left in regulation, a poor punt by Minnesota’s Mike Eischeid traveled only 11 yards and gave the Cowboys the ball at their 40. Dallas took advantage, driving 60 yards in eight plays. At one point, Hill fumbled on a third-and-three play at the Minnesota 22 but the Cowboys still ended up with five yards and a first down when WR Bob Hayes recovered. Three plays later, Hill ran for an eight-year touchdown and, with Herrera adding the extra point, the Cowboys were ahead by 21-20 with 2:26 remaining to play. In response, the Vikings advanced 68 yards, with Tarkenton connecting with RB Ed Marinaro for a key first down. The breaks now began to go Minnesota’s way again. First, Tarkenton appeared to fumble when hit by CB Benny Barnes on a blitz, but the officials ruled that the play was dead before the quarterback lost the ball. Then, passing in a third-and-12 situation, Foreman gained 17 yards but fumbled, still managing to recover amid a crowd of defenders. Tarkenton followed up with another throw to Marinaro for 20 yards and that set up a 27-yard Fred Cox field goal attempt with one second left on the clock. While the officials were slow to signal as the kick passed near the right upright, it was successful. The Cowboys disputed the call but Minnesota was the winner by a final score of 23-21. The Vikings led in total yards (376 to 273) and first downs (18 to 16). Dallas outrushed Minnesota (144 to 111) but the Vikings had far more net passing yards (265 to 129) and the Cowboys turned the ball over four times, all on interceptions, to none by Minnesota. 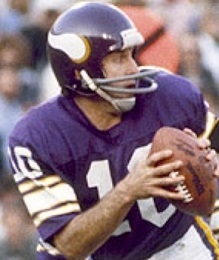 Fran Tarkenton completed 17 of 27 passes for 283 yards and two touchdowns with no interceptions. Chuck Foreman accumulated 203 yards from scrimmage, gaining 72 yards on 23 rushing attempts and 121 on five pass receptions that included two TDs. For the Cowboys, Roger Staubach had a rough performance as he succeeded on just 9 of 20 throws for 144 yards and two TDs, giving up four interceptions. Calvin Hill (pictured at right) ran for 95 yards and a TD on 21 carries and was one of three Dallas players with a team-leading two pass receptions. Golden Richards, with his one long scoring catch at the beginning of the game, led the club with 58 receiving yards. Minnesota reached 5-0 before losing two straight, but breezed to the NFC Central title with a 10-4 record. The Vikings again won the conference championship but lost to Pittsburgh in the Super Bowl. The Cowboys dropped to 1-4 the following week before reeling off four straight wins and seven in their last nine games, and they managed to lead the NFL in total yards (4983). The poor start doomed them, however, as they finished at 8-6 and third in the NFC East, missing the postseason for the first time since 1965. 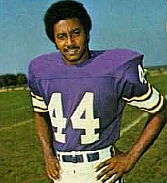 Fran Tarkenton, in his 14th year, passed for an NFC-leading 2598 yards and was chosen to the Pro Bowl as well as being a second-team All-NFC selection by UPI. Chuck Foreman continued to be productive both running and catching the ball, with 777 yards on 199 rushing attempts, 586 yards on 53 pass receptions, and a total of 15 touchdowns. He was also a consensus second-team All-NFL and first-team All-NFC selection and was named to the Pro Bowl for the second year. Things ultimately got better for Roger Staubach, but as it was he still had his poorest season as a starting quarterback. His completion percentage (52.8), yards per attempt (7.1), and passer rating (68.4) were all career lows and he threw more interceptions (15) than touchdown passes (11). But it proved to be an aberration in his Hall of Fame career; he would never again miss selection to the Pro Bowl in his five remaining years with the Cowboys.